It’s more than a milestone. It’s a moment to be seized. And an opportunity to secure forever Allegheny College’s rightful place as one of the great liberal arts colleges in the history of the United States. Allegheny has moved from hidden jewel to respected national leader. Alumni who once had to explain where they went to college, now see nods of respectful recognition when they say, “I went to Allegheny College.” U.S. News & World Report — which always has ranked Allegheny as one of the nation’s Top 100 National Liberal Arts Colleges — now identifies Allegheny as the USA’s No. 1 “Up and Coming” National Liberal Arts College. Newsweek ranks us No. 20 in the nation for academic rigor — just behind Harvard and just ahead of Duke. And we remain one of the colleges featured in every edition of Loren Pope’s Colleges that Change Lives — the seminal book on the nation’s greatest liberal arts colleges. The College has attracted a faculty of premier teachers and researchers – one of the best in the nation – and invested to retain them. We have beautified our campus. Allegheny always has been idyllic. Now it is breathtaking. Forty-five percent of our graduates immediately go on to graduate school; within five years, 80 percent of Allegheny graduates are continuing to pursue their educations. We are an acknowledged U.S. environmental leader. And we are the nation’s No. 1 leader in the noble quest to make political debate more civil through the annual awarding of the Allegheny College Prize for Civility in Public Life at the National Press Club in Washington, D.C.
On Graduation Day, Allegheny now is a destination for national commencement speakers such as E.J. Dionne and Douglas Brinkley, and honorary degree recipients such as Arnold Palmer and Tom Ridge. There is yet one unattained achievement that stands between us and an unmistakably certain future of greatness. And that is to increase our endowment. Thanks to the generosity of its donors, Allegheny has built an endowment of more than $220 million. Colleges of lesser stature crave such a generous endowment. But the stewards of Allegheny College know that in order to ensure Allegheny’s ongoing place as one of the nation’s great liberal arts schools – and to climb to even greater heights – we must increase our endowment substantially. Only by generating greater annual support for operations through a larger endowment can Allegheny make the investment needed in scholarships, faculty, global immersion and national recognition. Endowment growth is not a luxury. Simply put, if we fail to seize this moment and increase our endowment, we won’t just fail to grow, we could decline. Because in today’s competitive higher-education marketplace, to stand pat is to fall behind. Lesser schools are failing. Resting on one’s laurels, even two centuries’ worth, would be a formula for retreat. And so we launch “Our Allegheny” – Allegheny’s quest, as it approaches its 200th anniversary, to double its endowment – and in so doing, to further catch the attention of the nation. To assure our future. And to grow to even greater heights. On an autumn day in 1822, three horse-drawn wagons clopped onto campus, ending a long journey to Meadville – still a relative outpost on the American frontier. The wagon carried three tons of books. The journey started in Boston, at the home of one James Winthrop, a Boston judge and close friend of Allegheny patriarch William Bentley. Judge Winthrop possessed one of the most coveted private book collections in the United States. Lamenting that his own children had not inherited his love of books – but knowing that a young college on the American frontier had – Winthrop bequeathed the bulk of his collection to Allegheny College. And so the books were loaded on wagons and sent 600 miles west. From Boston. To Albany. To Buffalo. To Meadville. More than 3,000 volumes in all. It was an extraordinary gift. And it instantly gave Allegheny one of the leading academic libraries – and one of the most sterling academic reputations – in the young United States. The letter was written by former President Thomas Jefferson. 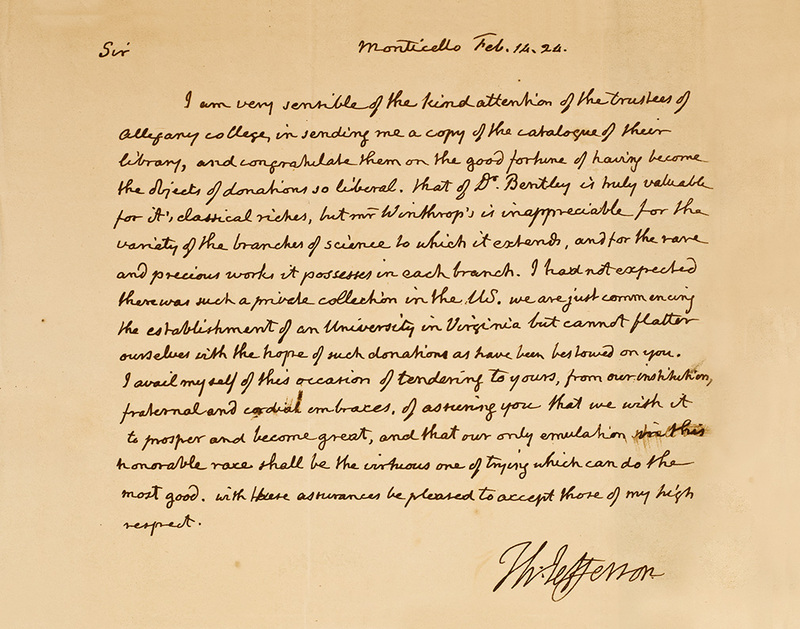 Dated Feb. 14, 1824, and penned from Monticello, the letter remains in the Pelletier Library Archives today. The letter memorialized Allegheny as a college of national stature. It established unequivocally the greatness that is our heritage. It set a standard of national excellence that still drives us today. And it is a riveting demonstration of how powerful an Allegheny College capital campaign can be. Now, in our 200th anniversary, we will once again seek “donations so liberal” that we will be seen in perpetuity as one of the premier institutions of our kind in the land. The leadership of the Our Allegheny: Our Third Century Quest campaign includes fourteen co-chairs. They come from a variety of professional backgrounds but they all share an unwavering commitment to the continuing success of Allegheny College.